From 28 November to 20 December 2016 Nollie and I had a great time travelling and birding in the beautiful central-southern part of Chile. We rented a car from Santiago airport for the whole period. The roads are good, and hotels are easily found while travelling by using booking.com on our mobile phone with a Chilean prepaid sim card. The itinerary was partly based on the old but still useful birding guide by Mark Pearman, partly on some birding trip reports via cloudbirders, and partly on recent observations in eBird.org and observado.org. In the latter we used some exact locations of target species that were recently found by Arjan Dwarshuis in his Biggest Year. 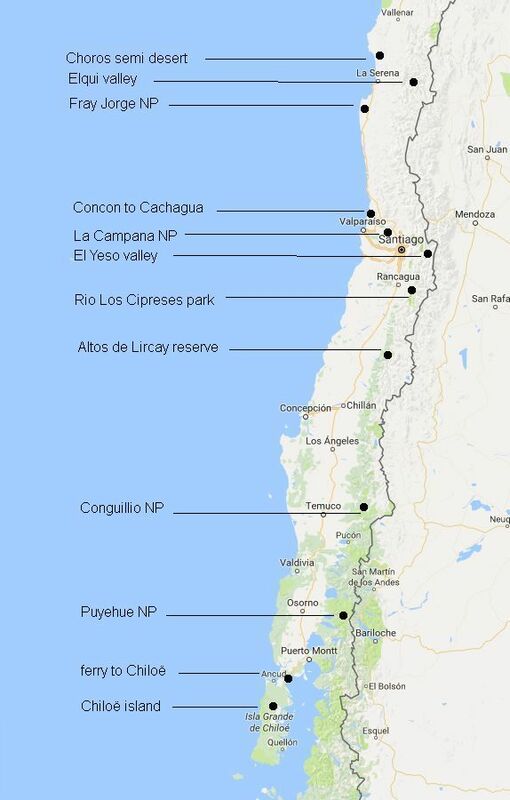 We started with La Campana NP, not far from Santiago (see Chile map below). Then we visited some coastal sites nearby before driving up north to the amazing Fray Jorge NP. From La Serena we visited both the Choros semi-desert and the barren Elqui valley. We then drove straight down to the famous El Yeso valley for the high-altitude specialties. Then along the Rio Los Cipreses nature park to the Altos de Lircay reserve. Then straight down to Osorno for visiting the beautiful Puyehue NP along the main road to Argentina. The ferry to Chiloë island proved good for seabirds. Chiloë island itself is marvellous, especially along the west coast. On the way back north we visited Conguillio NP, which is nearly a must-see in terms both of scenery and birds. Back towards Santiago we again visited the impressive Altos de Lircay reserve as we had missed Chestnut-throated Huet-huet there on the first visit. In between these main sites we visited some minor sites, which can be seen on e.g. Google Earth via the kml-link below. Highway 5 runs all the way north-south through this country, and the birding sites are never far away from it. Accommodation in the towns and cities along the 5 can be much better value for money than further away from it, especially in the business hotels with large discounts via booking.com. Also, in these hotels you can have a very early (and extensive) breakfast. Chile may not be as rich in bird species as other countries in South America, but this (as well as the fact that Chile is a bit expensive) is compensated by the beautiful scenery and the ease of travelling. A species list is at the bottom of this page. See also the long separate page with bird photos. Map with the main birding sites of our trip. Field observations were recorded in the Android app Obsmapp and uploaded to observado.org. This field app is the quickest way to keep track of individual bird observations. I also use eBird but as this is based on a bird list for a given area rather than individual observations, it takes more time in the field. Our 181 recorded observations can be found in chronological sequence at https://goo.gl/mtU8tI and in systematic sequence at https://goo.gl/BM6xjx. As field guide we used of course Birds of Chile by Alvaro Jaramillo (2003). We also brought the wonderful Wildlife guide to Chile by Sharon Chester (2008). The latter is also good for a better understanding of the very different biozones in this elongated country. La Campana NP near the Olmuë entrance which is at -32.982913, -71.134207. You can enter here on foot before the gate opens and pay when coming back. Most birding here is done within 1 to 2 km from the entrance. A good introduction to birding in Chile, and also rather essential for the dry forest habitat. Inside the park are a few trails and the main sand track of the photo below. No cars allowed. At the mouth of the Aconcagua river at -32.918210, -71.505426, opposite Concon town. A good wader and marsh bird area with nice platforms. The rocky shore of Cachagua, well known for its Humboldt Penguin colony on an island around the corner. We parked the car near -32.579274, -71.453662 and walked the steps down, then this trail SW along the bottom towards the viewpoint opposite the penguin island. Along this trail we saw six Seaside Cinclodes in total. Between Ovalle and Fray Jorge NP, this Hacienda Santa Cristina lodge at -30.535893, -71.443558 is a real gem set in a sort of oasis. Barn Owl active at dusk here. The very helpful owner gave us directions how to best reach the Fray Jorge NP and assured us that this can be done in a normal car. How to reach Fray Jorge NP. 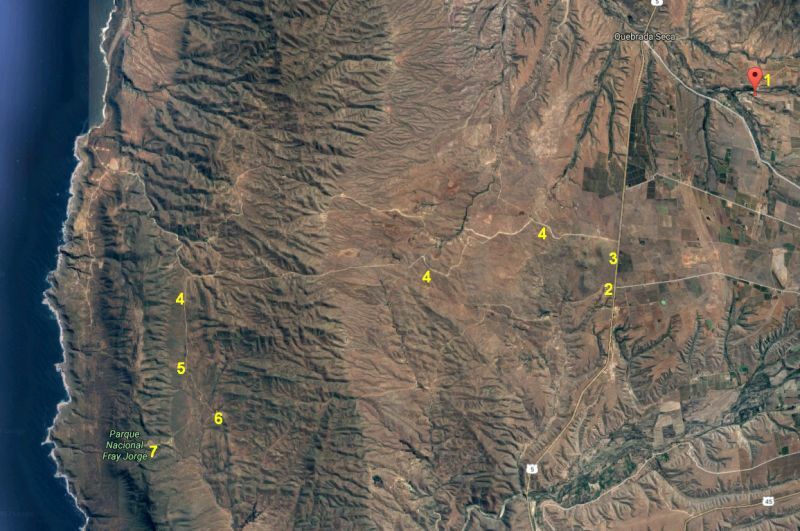 1= Hacienda Sta Cristina lodge, 2= leave highway 5 at -30.600172, -71.497778 (signposted Fray Jorge NP), 3= follow the parallel road (Cinereous Harrier in the adjacent field), 4= keep this dirt road, 5= pay here for the national park, 6= small museum and some large planted trees (Lesser Horned Owl). Carefully drive the sometimes steep gravel road up to 7, and park there for a circular walk in the area of the mist woods. Nollie on the trail in Fray Jorge NP. Remnants of woods that can only survive in this dry climate thanks to the sea mist. Both Moustached Turca and White-throated Tapaculo here. Both also present in the small gorge NE of the 3rd '4' in the map above. Inside the mist woods of Fray Jorge NP. Well east of Vicuña town in the barren but beautiful Elqui valley, famous for its many astronomy observatoria. Grey-flanked Cinclodes and Spot-billed Ground-Tyrant at -29.923864, -70.301788. We stayed in the lovely Hosteria Vicuña at the border of the town, where Burrowing Parrots fly around at dusk. The semi-desert some 100 km north of La Serena, along road 110 west of highway 5. Leave the highway at -29.366306, -71.138513. We saw several Common Miners here, very pale, and probably belonging to the uncommon deserticolor subspecies. Here we also saw our only guanacos of the trip. Driving along highway 5 towards Santiago from the northwest, we decided to just drive the ring road 70 all the way west around Santiago up to the La Florida exit in the southeast of Santiago. From there it is still a long drive along the Maipo valley to the start of the El Yeso valley. There is plenty of accommodation in the Maipo valley, although what we chose on booking.com (Los Abedules in San Alfonso) was not good and clearly overpriced. Maybe best to just try along the road, but not in the weekends which reportedly are very busy here. In San Alfonso we had a good meal in the Cascada de las Animas resort, which may be good for a room also, anyway in a very green setting. The high Andes southeast of Santiago, in the El Yeso valley, famous as probably the best place for Diademed Sandpiper-Plover. Of course also good for many other high-altitude bird species. Driving up this valley from San Gabriel we soon had our only Crag Chilia of the trip, at -33.773760, -70.168994. The El Yeso reservoir. This can be reached with a normal car, although with some care (drive slowly). Especially the sandy road above the reservoir (from where this picture was taken) must be driven with care. The aim of driving this far are the green mossy patches beyond the reservoir as this is where the Diademed Plover is found. Along the sand road above the reservoir we had Sharp-billed Canastero and Cinereous Ground-Tyrant. Nollie scanning for the target bird here, the Diademed Sandpiper-Plover of the photo below. We also found Grey-breasted Seedsnipe here, and a group of six Andean Condors at a dead animal. Also Rufous-banded Miner here. On our way to the Rio Los Cipreses nature park. Except for the large Burrowing Parrot colony, this park is probably not essential for a birding trip to Chile, but as we stayed in Rancagua after our day trip to El Yeso, this was a nice area to go in the morning. The bridge from where this picture was taken is at -34.235047, -70.481966. To enter the park drive along the south side of the river to -34.265775, -70.465233. Lesser Horned Owl was pointed out by the friendly warden right behind the entrance of Rio Los Cipreses park. In the overwhelming forest of El Pionero trail above Aguas Calientes in Puyehue national park, the park along the road from Osorno to Argentina. Black-throated Huet-huet, Magellanic and Chucao Tapaculo all seen along thi trail just above and below -40.73820, -72.311693. On our trip, we heard the loud chucao call in many places but the bird is very shy. The scenery of inland Chiloë island is often very much like in NW Europe. One of the many lagoons on Chiloë island. Typical bay along the ocean coast of Chiloë island. The endemic Des Mur's Wiretail was not difficult to find, like in the brambles front left. It was even at the parking place of our lovely Kim Piyan cabaña at -41.868739, -73.748319, east of Ancud. Scanning the Magellanic Penguin colony from the beach at -41.926279, -74.039815 (Puñihuil). After this and the above bay we also visited Chepu bay a little further south. All bays are worthwhile. The trail inside the densely wooded El Tepual part of Chiloë national park at Cucao (the road to Cucao is asphalted all the way). Here we chose to stay in a nice cottage of the national park instead of one of the hostels in Cucao. Near the cottages is also a must-visit café restaurant. The ferry crossing to and from Chiloë island was rewarding in terms of seabirds. These are mostly concentrated in the middle part of the crossing. We had a dozen 'Pincoya' storm petrels, several Pink-footed Shearwaters, a Chilean Skua, White-chinned Petrel and Magellanic Diving-Petrel. The Llaima twin volcano in Conguillio national park, seen across the rather recent and barren lava field. We entered the park from the south. The wonderful, open Araucaria (monkey-puzzle tree) forest in the highest part of Conguillio NP. The dust road across this park is no problem for a normal car. The Llaima twin volcano of Conguillio NP. Me in the wonderful Conguillio NP. The tall forest along the Sendero Los Carpinteros (the woodpecker trail) in Conguillio NP. Slowly walking this trail we discovered our target bird, the Magellanic Woodpecker, a pair. We stayed as long as possible in the park and were glad to find accommodation after leaving the park in the direction of Curacautin for 8 km at -38.552402, -38.552402 (a small shop with good rooms). Driving a further 18 km on to Curacautin would also have resulted in a room, as we saw several hospedajes (pensions) there the next day. However, this probably means you have to drive in the darkness, we now arrived just at dusk at the mentioned shop with rooms. Given how nice we had found the coastal sites NW of Santiago, we could not resist to drive west to the ocean from Chillan. And indeed the coast is wonderful here too, like at this 'Iglesia de Piedra' at -36.09891, -72.8116. Driving further north along the coast we had our only Ochre-flanked Tapaculo of the trip at 35.934809, -72.719208. Visitors to the famous Altos de Lircay reserve have to walk this 2 km stony track from the parking place at 35.604045, -71.072307 up to the entrance, where you may enter before opening time and pay when coming back. We stayed nearby in the lovely Hostería de Vilches at -35.583289, -71.114151 so we were early at the gate. The hostería is/was not on booking.com so we had called them from the lowlands (+56 9 9826 7046). We came here mainly for a last try to see Chestnut-throated Huet-huet, and we succeeded with full views especially at -35.602175, -71.04725. As a bonus we saw Magellanic Woodpecker again, at the parking place. View from one of the two trails near the entrance of Altos de Lircay reserve. Back north towards Santiago along highway 5. Driving north means that it gets progressively hotter, which feels so strange compared to what we are used to in the northern hemisphere. Diademed Plover* (DSP) - Phegornis mitchellii - upstream of the El Yeso reservoir, before (!) bridge over river. Dark-bellied Cinclodes* - Cinclodes patagonicus - rather common near streams etc. Spectacled Tyrant - Hymenops perspicillatus - at Chepu coastal plain of Chiloë, recent expansion from mainland? See also the long section with bird photos.